No? I'm not surprised. I started it way back in the beginning of February. 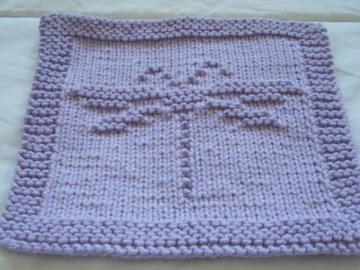 Now, it may not be the famous Elizabeth Zimmermann pattern, but it is for a baby and I am extremely surprised that I ever got around to finishing it. 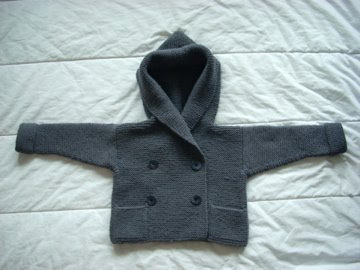 Thus, I feel somewhat justified in referring to it as a baby surprise jacket of sorts. Check it out! I'm going to be shipping it off to my nephew on Monday. I sure hope it fits him and that it's not going to be too warm for him to wear. Of course, Minnesota still gets cold sometimes, even in the summer. 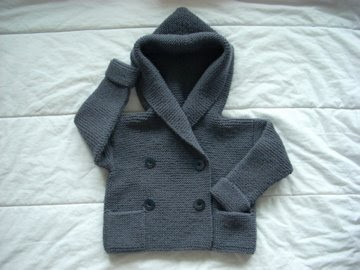 I knit this Duffle Coat from Debbie Bliss' Essential Baby (size 9-12 month) using seven balls of Knitpicks Swish DK in Mist. I used size 6 Knitpicks Harmony Options needles. Although I started this little project on February 1, I didn't finish it until May 1, even though before February was even over all I had to do was knit up the sleeves. 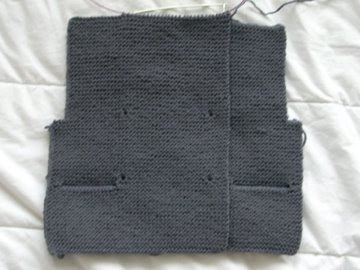 I ended up doing all of the seaming before doing the sleeves and then picking up stitches around the arm holes and knitting the sleeves top down in the round. I finished the first one before my spring break, which started sometime in March, but the second one I didn't start until the end of April. After finishing the second one, I then went back and ripped out a few inches of the first to make it longer, as my nephew apparently has long arms and the sleeve looked short to me. I'll post pictures of him wearing as soon as I get some! I also ripped out that lavender market bag that I was working on. I was never going to use it. I saved the bottom spiral to use as a washcloth, and then used what I had ripped out to make a second washcloth. I was searching on Ravelry for things that I could make with this yarn, and came across this project and liked it, so I emailed the designer and she sent me the pattern. It took less than two hours to make, which is exactly what I needed. I have been wanting to do quick knits lately because the idea of starting something that is going to take months to finish is a bit daunting right now. Speaking of things that take months to finish, here is something that you have never seen. I started this lace stole last June while participating in the Mystery Stole 3 KAL put together by PinkLemonTwist. Well, it is almost June again, the shawl theme is no longer a mystery, the pattern is for sale, and I am not even halfway done. I haven't worked on it for months, but I feel bad that I haven't finished it yet as it has almost been a year and I promised my mom I would give it to her. I have nothing else on my needles right now (except for that random project I started last night, and the Hemlock Ring Blanket that I am still halfway through binding off), so I am hoping to get a good chunk of this done. 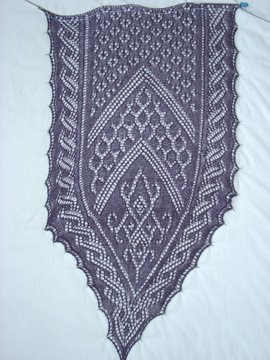 I have joined another shawl KAL that starts this June, so I'm hoping to be done before then. Wish me luck! OMG, I can't believe you're knitting dishcloths now! Somebody stage an intervention, stat! They are all beautifully knit, Peter. YOU are a natural born knitter. I've been knitting for 35 years, and I envy your work! Which nephew is that for? Cause Xander's huge apparently and I hate to say this but at 10 mos now he may be too big for 9-12 mos. So maybe it will have to be Darby in the fall. Two Ply, or not Two Ply?